I received a package last week from Goose Island Beer's Head Brewmaster, Brett Porter. Actually, the media kit may have just been sent on his behalf, but he did say he welcomes the opportunity to chat about their barrel-aging program or the beer they sent me in particular, Madame Rose Belgian Style Wild Ale. Along with the wine-sized bottle was a really nice glass and some tasting and food pairing notes. Madame Rose is named after Belgium's first female Brewmaster, Rose Blancquaert-Merckx, hence the choice of her first name on the label (I made that part up). Rose's passion for promoting the Oude-Bruin style of beer with the world while working at Liefmans is the inspiration for this beer. 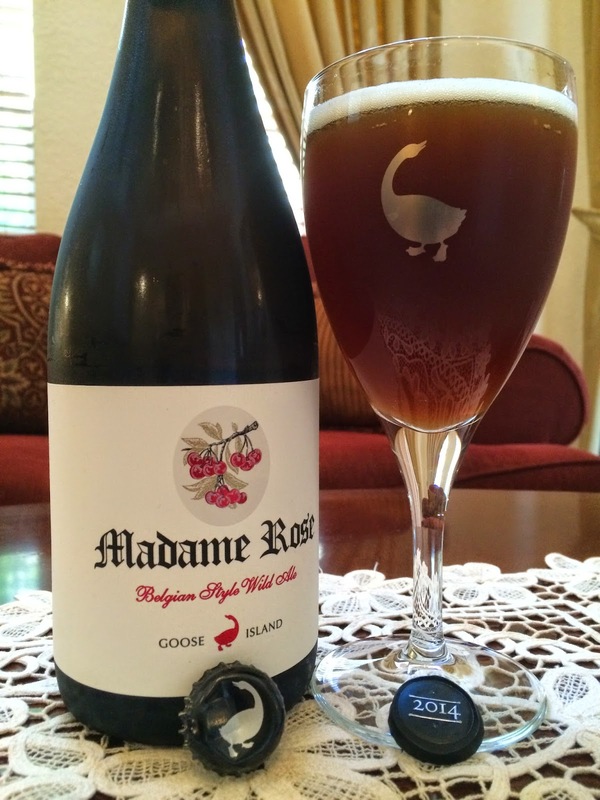 Goose Island suggests pairing Madame Rose with "complex, decadent dishes" such as chicken with chocolate mole sauce or sherry-braised lamb shank or with Bleu-veined cheddar cheeses. The label is the same as the first time I tried this beer, though that was a 22 oz bottle and 2012 vintage. Looks like it was just about a year ago that I checked that out. Classic eggshell white background with a simple cherry illustration. This is an "ale brewed with [Michigan] cherries and aged [for 18 months] in [Cabernet] wine barrels [before being blended with other barrels]." 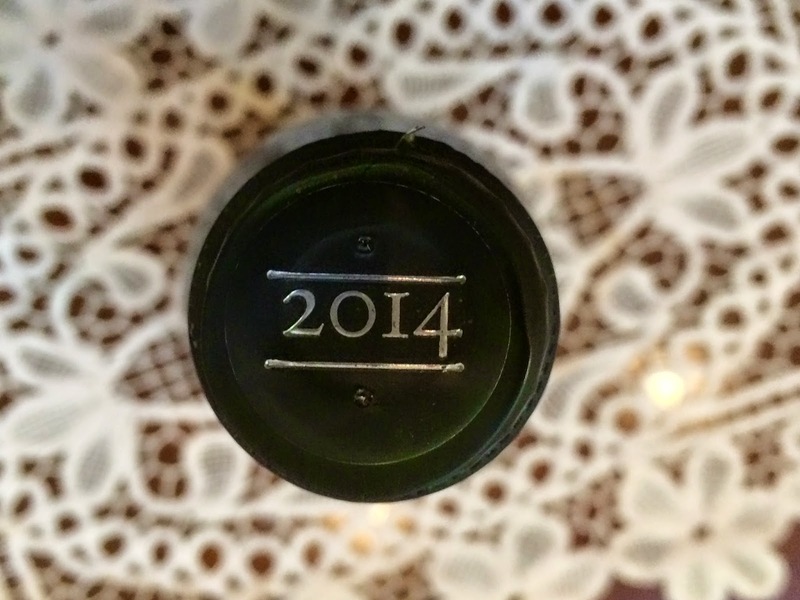 Bottled on 06MAR14. 6.7% alcohol. 1-800-GOOSE-ME. Not much head. Perhaps I was too careful with my pour considering the head shown in the media kit photo. Guess I need to pour harder! I decided to go for an elegant picture setting--did I succeed? Leather and cherries with a lightly tart aroma--nice though not particularly strong. Ooh, mama! Wow, that is tart! Like feel it in the sides of your neck tart! Cherry flavors are spectacular, deep and complex, stand-outs. Their sweetness works perfectly with the vinegary sour base of the beer. Brett funk is present all along the way though not overly pronounced. Madame Rose shows some of the cabernet wine barrel wood and grape character, especially toward the finish. As some of the vinegary sour and cherry fruit disappears at the end of each sip, some leathery flavors are left behind in a dry aftertaste. Nice body. Prickly carbonation helps bring out the sharp and assertive tart/sour aspects of the beer. Complex and a tasty bud to wake up those taste buds. By the end of "Big 765" you should be mostly used to the tartness, but every sip is still a reminder that Madame Rose is tart to the last drop! Check it out!